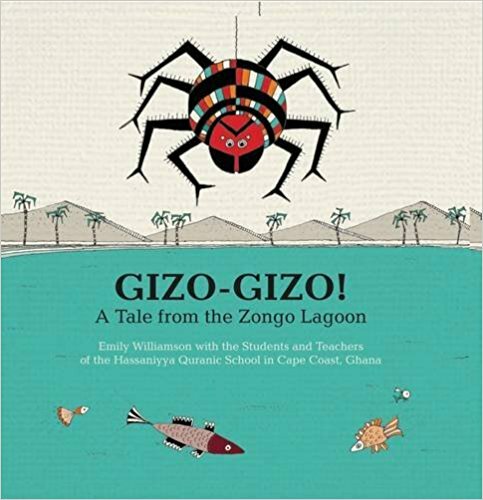 Emily Williamson is the author of the children's picture book Gizo-Gizo! : A Tale from the Zongo Lagoon. She wrote the book with the students and teachers of the Hassaniyya Quranic School in Cape Coast, Ghana. The book is a winner of the 2017 Children's Africana Book Awards. 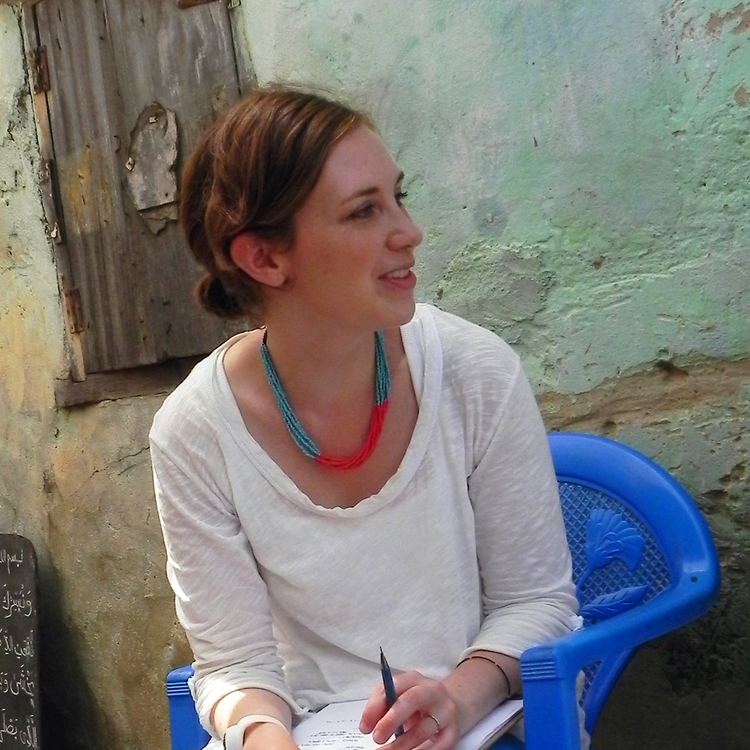 She is an anthropology Ph.D. student at Boston University, and has taught landscape architecture at Rhode Island School of Design. Q: How did you end up working with Ghanaian students and teachers on this book project? A: I have been working with the Cape Coast Zongo for many years on a range of community-based projects concerning the complex interactions between water infrastructure and social life. We asked questions such as how one might imagine a long-term plan for the community that both respects local cultural values and addresses environmental and sanitation concerns. As part of this initiative, I began working with the students at the Quranic School. I encouraged them to think both about local challenges their community faced concerning the environment and to imagine possible alternatives. Over a few years, the workshop organically took hold and resulted in the creation of this book. Q: The book focuses on the importance of the environment. How did you create this particular story, and what was its significance for the students you were working with? A: While we began with the larger topic of the environment (and water more specifically), we brainstormed about specific challenges the community currently faced. I recall one little boy raising his hand shyly and explaining that a few months before the community didn't have any water from the pipes because the mining companies operating to the north had polluted all of the rivers and lakes downstream. Other students chimed in with more details their families faced during that three-week period. From there, we went on to imagine the setting, characters (their personalities and the roles they would play in the story), and how the problem would be solved. The students then chose scene(s), character(s) and/or objects in the story to draw and write about. In addition to drawing and writing, we also wrote short skits in which they took on the roles of the characters in various situations and performed them for the community. It was truly an evolving, open process and collaborative effort composed of over 30 voices, drawings, and texts. Q: What role did Ghanaian folktales play in the development of the story? A: While I've read quite a few Akan and Hausa tales (many about liminal tricksters like spider), the story's plot line, feel, beginning, and end have more to do with the students memories of listening to their grandparents telling them stories, their everyday experiences, and imagination than anything else. A: I hope those reading this story (whether in Ghana, the U.S. or somewhere else) will identify with the challenges the characters face and be reminded of valuable, locally relevant lessons about pollution, sanitation, and values about taking responsibility for ones actions towards others. Even more than that though, I hope this book will inspire ways of story-telling that are rooted in experience, are collaborative, and place emphasis on the complex processes of creating these stories more than the products themselves. A: At this very moment, I'm in Ghana learning the Hausa language in preparation for my fieldwork in an anthropology Ph.D. program. Partnered with local non-profits and volunteers, I will also be involved in a story-telling workshop with students in a Zongo community later this summer. And, in preparation for this workshop, we've been creating lesson material that will be freely accessible and downloadable on our website in the coming year. These lessons also include many drawings students have done in the past for other story ideas. A: The students are so very proud of their work and I look forward to sharing their acceptance speeches for the CABA book award on our website in the coming months! Hello, Deborah. Thanks so much for this informative interview. I am trying to get in touch with Emily Williamson to get info about her book, GIZO-GIZO so we can add the title to abookandahug.com. Can you share her email address with me? You can email back at bookandahug. @gmail.com ...Thanks so much. Thanks for commenting! I'll email you!